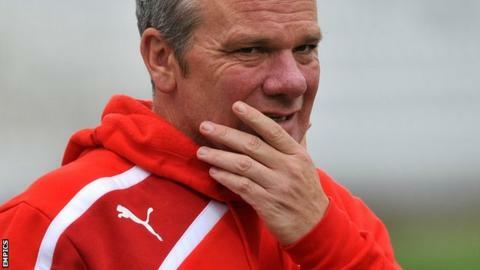 Nottinghamshire's Mick Newell has said he was interviewed for the vacant England head coach role on Wednesday. Newell, 49, is understood to be one on a list of candidates including Lancashire coach Peter Moores and Sussex cricket manager Mark Robinson. England have been without a head coach since Andy Flower quit in January. Peter Moores: After coaching England between 2007 and 2009, in 2011 he led Lancashire to their first County Championship since 1934. Ashley Giles: Took Warwickshire to the title in 2012 before taking over England limited-overs duties and reaching the final of the 2013 Champions Trophy. Trevor Bayliss: Took Sri Lanka to the 2011 World Cup final, coached Kolkata Knight Riders to the IPL title in 2012 and won his second Sheffield Shield with New South Wales in March. Mick Newell: County cricket's longest-serving coach has led Nottinghamshire to two Championship titles since 2002 and coached England Lions on their West Indies tour in 2011. Mark Robinson: The former seamer has won six trophies since succeeding Moores at Sussex in 2005, including two Championships, and drew positive reviews on his first Lions tour to Sri Lanka in the winter. "I was told I'd got an interview and I got that interview this morning, so we'll see what happens," Notts director of cricket Newell said. Flower quit following this winter's disastrous 5-0 Ashes defeat, and Newell had previously told the BBC's Test Match Special he would be applying for the role, for which current England ODI and T20 head coach, Ashley Giles, is seen as the favourite. Moores, who was axed from England's top job in 2009, has also publically put himself forward as a candidate. England chief executive David Collier said earlier this month that an appointment was "close". Newell feels the time was right to push his claims, having led Nottinghamshire for more than a decade, during which time he has won two County Championship titles. His team also won the YB40 competition last year, the club's first one-day trophy since 1991, while he has some international coaching experience with England Lions. "In three or four years time I will be in my early to mid-50s and I think there will be a new generation of coaches coming through," Newell added to BBC Radio Nottingham. "From my perspective I feel this is my opportunity and that's why I put my application in." The England and Wales Cricket Board's new appointment may look to revamp the squad following the retirement of spinner Graeme Swann and controversial sacking of batsman Kevin Pietersen.